Clinically it is understood that rapid increases in training loads expose an athlete to an increased risk of injury; however, there are no systematic reviews to qualify this statement. The aim of this systematic review was to determine training and competition loads, and the relationship between injury, illness and soreness. The MEDLINE, SPORTDiscus, CINAHL and EMBASE databases were searched using a predefined search strategy. Studies were included if they analysed the relationship between training or competition loads and injury or illness, and were published prior to October 2015. Participants were athletes of any age or level of competition. The quality of the studies included in the review was evaluated using the Newcastle–Ottawa Scale (NOS). The level of evidence was defined as strong, ‘consistent findings among multiple high-quality randomised controlled trials (RCTs)’; moderate, ‘consistent findings among multiple low-quality RCTs and/or non-randomised controlled trials (CCTs) and/or one high-quality RCT’; limited, ‘one low-quality RCT and/or CCTs, conflicting evidence’; conflicting, ‘inconsistent findings among multiple trials (RCTs and/or CCTs)’; or no evidence, ‘no RCTs or CCTs’. A total of 799 studies were identified; 23 studies met the inclusion criteria, and a further 12 studies that were not identified in the search but met the inclusion criteria were subsequently added to the review. The largest number of studies evaluated the relationship between injuries and training load in rugby league players (n = 9) followed by cricket (n = 5), football (n = 3), Australian Football (n = 3), rugby union (n = 2),volleyball (n = 2), baseball (n = 2), water polo (n = 1), rowing (n = 1), basketball (n = 1), swimming (n = 1), middle-distance runners (n = 1) and various sports combined (n = 1). Moderate evidence for a significant relationship was observed between training loads and injury incidence in the majority of studies (n = 27, 93 %). In addition, moderate evidence exists for a significant relationship between training loads and illness incidence (n = 6, 75 %). Training loads were reported to have a protective effect against injury (n = 9, 31 %) and illness (n = 1, 13 %). The median (range) NOS score for injury and illness was 8 (5–9) and 6 (5–9), respectively. A limitation of this systematic review was the a priori search strategy. Twelve further studies were included that were not identified in the search strategy, thus potentially introducing bias. The quality assessment was completed by only one author. 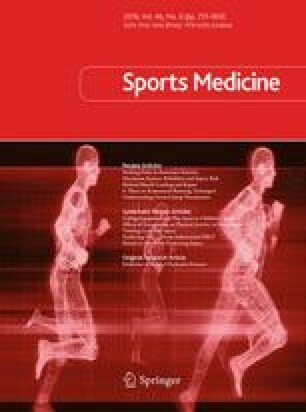 The results of this systematic review highlight that there is emerging moderate evidence for the relationship between the training load applied to an athlete and the occurrence of injury and illness. The training load applied to an athlete appears to be related to their risk of injury and/or illness. Sports science and medicine professionals working with athletes should monitor this load and avoid acute spikes in loads. It is recommended that internal load as the product of the rate of perceived exertion (10-point modified Borg) and duration be used when determining injury risk in team-based sports. External loads measured as throw counts should also be monitored and collected across a season to determine injury risk in throwing populations. Global positioning system-derived distances should be utilised in team sports, and injury monitoring should occur for at least 4 weeks after spikes in loads. Funding Caroline Finch was supported by a National Health and Medical Research Council (of Australia) Principal Research Fellowship (ID: 1058737). No other sources of funding were used to assist in the preparation of this article. The Australian Centre for Research into Injury in Sport and its Prevention (ACRISP) is one of the International Research Centres for Prevention of Injury and Protection of Athlete Health supported by the International Olympic Committee (IOC). Michael Drew and Caroline Finch declare that they have no conflicts of interest relevant to the content of this systematic review. Wells G, Shea B, O’Connell D, et al. The Newcastle-Ottawa Scale (NOS) for assessing the quality of nonrandomised studies in meta-analyses. 2000. Available at: http://www.ohri.ca/programs/clinical_epidemiology/oxford.asp. Accessed 17 Oct 2015.